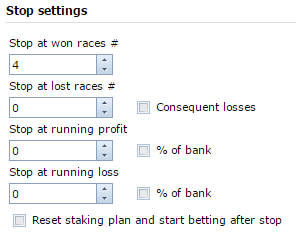 Recently we received many inquiries from our members confused with stop betting settings. When they set ‘Stop at won races #’ the bot stopped immediately after next bet, not matter what was outcome. This happens because you may already have many wins that bot counted for many days while your system was running. For example, on the next image you can see that number of wins is 7, so when you set ‘Stop at won races #’ = 4 in Settings you already have enough wins to stop. The bot will stop when these figures will be checked after next settled bets. Even if this bet lose, you still have 7 wins, so the bot will stop betting. If you click “Yes” the bot will reset Wins #, Losses # and Running profit and start counting from 0. This way betting will be stopped after 4 wins recorded since the moment you changed settings. If you click “No” all figures will be left untouched. You should know what you are doing then. It is also possible to reset Wins #, Losses # and Running Profit at any time by restarting betting (click ‘Stop betting’, then ‘Activate betting’).